It was supposed to be rainy today, so it didn’t look good for my water heater flush project. But as it turned out it was bright and sunny. So the flush was on. As I mentioned before, this should be done every year, but with all the things going on last year, it got missed. This is the procedure I’ve always used. 1. Turn off power/gas to water heater. 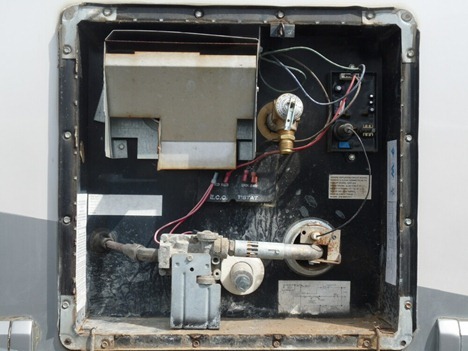 Be careful not to apply electric power to the unit until it’s full of water. Otherwise you can burn out your unit. 2. Open faucet and run water until no hot water is left. Leave faucet open. 3. Turn off water to coach. 4. Remove the drain plug (the bottom one) and let a few cups of water out. 5. Replace the drain plug and remove the T&P valve (the top one). 6. Pour about a cup of vinegar into the top hole. I use a turkey baster. 7. Replace the T&P valve and tighten down. 8. Turn the water back on and check the open faucet. As soon as the water is flowing smoothly, turn it off. 9. Turn power to water heater back on and wait an hour or more. 10. Turn off power to water heater. 11. Open faucet and run water until no hot water is left. Leave faucet open. 12. Turn off water to coach. 13. Open bottom drain plug and let water run out. 14. 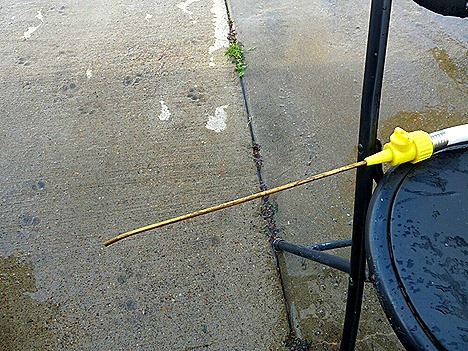 Use your ‘magic wand’ to flush out all the gunk still inside the water heater. You will be amazed at how much gunk will come out. I got 4 handfuls like this, plus a lot of smaller stuff too. The vinegar step and this wand are the secret to doing a good job on this. 15. Continue until only clear water is running out. 16. Replace the drain plug and tighten securely. 17. Turn on water to coach. 18. Leave the hot water faucet open until it stops spitting and spurting. 18. Turn the water heater back on. I originally got my cleaning wand at an RV rally, but you can get one online here. One thing nice about these Attwood water heaters is that they don’t have an Anode Rod that needs to be changed out regularly. Just that much less work and money. Tomorrow it’s back to work, with our dinner at Floyd’s Cajun Seafood again. A Penny For Your Thoughts. Five Bucks If They’re Dirty. 2 Responses to Flushed ! A water softener would prevent a lot of that. Beware Greg! I used that magical wand to do ours and the plastic had cracked. When I hooked it up to water the metal piece blew off and into the bottom of the water heater. It took hours to fish it out and probably would still be there if a nurse hadn’t had the right tool to get it out.